This Halloween TV Land presents... The Roseanne Scare-a-thon! 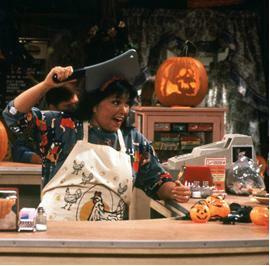 Join TV Land this Halloween season for the most spooktacular party around during The Roseanne Scare-A-Thon beginning tomorrow (Saturday, October 27) 1pm ET/PT! The Conners are master pranksters who never miss a chance to celebrate Halloween in all its gory glory. The Halloween marathon kicks off with the first Roseanne Halloween episode featuring the infamous "Castle of Horror" and continues through each Halloween episode ever produced! Tune in to see Roseanne's night at the Lobo Lounge dressed as a lumberjack, Roseanne's visit from the ghosts of Halloween past, present and future, as well as the episode culminating with the arrival of baby Jerry Garcia Conner. You won't want to miss these spooky back-to-back episodes featuring guest stars like James Pickens Jr. (Grey's Anatomy), Ed McMahon (The Tonight Show Starring Johnny Carson), Marlo Thomas (That Girl), Jennifer Saunders (Absolutely Fabulous), and Joanna Lumley (Absolutely Fabulous). Also remember to tune in for an encore presentation of The Roseanne Scare-A-Thon later that night beginning at 2:30am ET/PT. Then, keep the scary spirits alive all day long on Halloween, Wednesday, October 31 with the chilling Jurassic Park movie trilogy starting at 8am and your favorite Halloween-themed episodes from sitcoms M*A*S*H, The Cosby Show, Everybody Loves Raymond, and The King of Queens! 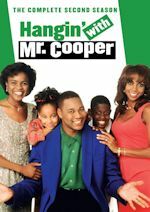 For the week of October 29-November 2, 2012, we have many current sitcom stars and past sitcom stars on TV talk shows! All times listed are Eastern. So get your DVR's (or whatever you use) ready! Ready? Here is all what you need to know for the coming week! Chris Rock (Everybody Hates Chris) - Watch Chris on Jimmy Kimmel Live! at 12am on ABC. Jimmy goes back to his hometown Brooklyn this week to tape the shows. Pavan will be attending Monday. Stay with us for updates. Kelly Ripa (Hope and Faith) - Kelly drops by Jimmy Kimmel Live! at 12am on ABC. Billy Gardell (Mike & Molly) - Billy appears on The Tonight Show with Jay Leno at 11:35pm on NBC. Tom Hanks (Bosom Buddies) - Tom visits The Late Late Show with Craig Ferguson at 12:37am on CBS. John Goodman (Roseanne) - John is a guest on Late Night with Jimmy Fallon at 12:37am on NBC. Flight opens in theaters on November 2. Krysten Ritter (Don't Trust the B---- in Apartment 23) - Krysten stops by Conan at 11pm on TBS. Jennie Garth (What I Like About You) - Jennie chats about her new Lifetime movie, The Eleventh Victim, on ABC's Good Morning America between 7-9am. Reba McEntire (Malibu Country/Reba) - Reba talks about her new show on LIVE! with Kelly and Michael, so check your listings. Malibu Country premieres on ABC on Friday, November 2 at 8:30/7:30c. Florence Henderson (The Brady Bunch) - Florence appears on Joy Behar: Say Anything! at 6pm on Current TV. Lisa Whelchel (The Facts of Life) - Lisa is a guest on The Jeff Probst Show, so check your local listings. Tracy Morgan (30 Rock/The Tracy Morgan Show) - Catch Tracy on Jimmy Kimmel Live! at 12am on ABC. John Goodman (Roseanne) - John continues to make the rounds on Comedy Central's The Daily Show with Jon Stewart at 11pm. Katey Sagal (Married with Children/8 Simple Rules) - Katey appears on Conan at 11pm on TBS. Steve Harvey (The Steve Harvey Show) - Steve is a guest on The Ellen DeGeneres Show, so check listings. Jennie Garth (What I Like About You) - Jennie talks about how she's starting over at age 40 on Katie, so check your local listings. She will also be on NBC's Today between 10-11am. Joey Lawrence (Melissa & Joey/Brotherly Love/Gimme a Break) - Joey visits The Jeff Probst Show, so check your local listings. Julie Bowen (Modern Family) - Tune in to see Julie on The Doctors, so check your local listings. Lily Tomlin (Malibu Country) - Lily appears on The Talk on CBS at 2pm ET/1pm CT-PT. 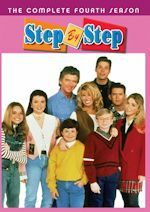 Lisa Whelchel (The Facts of Life) - Lisa guest co-hosts The Talk on CBS at 2pm ET/1pm CT-PT. Demi Lovato (Sonny with a Chance) - Watch Demi on The Late Late Show with Craig Ferguson at 12:37am on CBS. Sarah Silverman (The Sarah Silverman Program) - Sarah appears on Late Night with Jimmy Fallon at 12:37am on NBC. Chelsea Handler (Are You There, Chelsea?) - Chelsea visits Conan at 11pm on TBS. Jennifer Coolidge (2 Broke Girls) - Jennifer drops by The Talk on CBS at 2pm ET/1pm CT-PT. 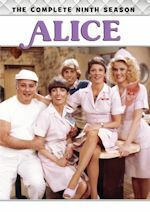 Vicki Lawrence (Mama's Family) - Vicki is a guest on The Talk on CBS at 2pm ET/1pm CT-PT. Challen Cates (Big Time Rush) - Challen chats on Hallmark Channel's Home & Family at 10am-12pm ET/PT. Maggie Elizabeth Jones (Ben and Kate) - Maggie visits The Tonight Show with Jay Leno at 11:35pm on NBC. Casey Wilson (Happy Endings) - Casey drops by Conan at 11pm on TBS. Tim Allen (Last Man Standing/Home Improvement) - Tim chats with the ladies of The View on ABC at 11am ET/10am CT-PT. Last Man Standing returns to ABC on Friday, November 2 at 8/7c. 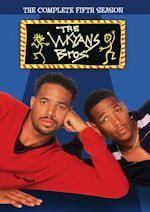 Wanda Sykes (The New Adventures of Old Christine/Wanda at Large) - Wanda stops by to talk about how she's balancing her busy life on Katie, so check your local listings. Sarah Silverman (The Sarah Silverman Program) - Sarah chats on Watch What Happens: Live at 11pm on Bravo. Jane Kaczmarek (Malcolm in the Middle) - Jane is a guest on The Talk on CBS at 2pm ET/1pm CT-PT. Brandon Routh (Partners) - Brandon appears on The Talk on CBS at 2pm ET/1pm CT-PT. Reba McEntire (Malibu Country/Reba) - Reba performs the Malibu Country theme song on ABC's Good Morning America between 7-9am. Jenna Fischer (The Office) - Watch Jenna on The Ellen DeGeneres Show, so check listings. Sarah Silverman (The Sarah Silverman Program) - Sarah drops by ABC's Good Morning America between 7-9am. She will also be on LIVE! with Kelly and Michael, so check your listings. Candace Cameron Bure (Full House) - Candace talks about her new romantic comedy, Puppy Love, on Marie on Hallmark Channel at 12pm ET/PT. Amanda Peet (Bent) - Amanda visits The Talk on CBS at 2pm ET/1pm CT-PT. Jennie Garth (What I Like About You) - Jennie continues to make the rounds on The Jeff Probst Show, so check your local listings. John Goodman (Roseanne) - John wraps up his appearances this week on ABC's Good Morning America between 7-9am. He will also be on Anderson Live, so check your local listings.